Spend time in the bustling Ho Chi Minh City which combines historic architecture with modern skyscrapers. See the famous landmarks and try your hand in the kitchen-Vietnamese-style, with a cooking class. Go back in time with an excursion to the Cu Chi Tunnels where you’ll have an opportunity to walk through a section of the immense underground tunnel system used extensively during the Vietnam War. Embark on your river cruise along the Mekong River and immerse yourself in the local cultures with a visit to a colorful market, the home of a local family making handcrafted sampans, and a workshop to learn how rice wine and traditional candies are made. 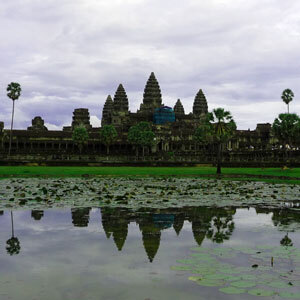 The grand finale of this memorable Southeast Asia river cruise vacation is a stay in Siem Reap, home to the phenomenal Temples of Angkor with an intricacy and architectural grandeur unmatched in the world. See the splendor of the Bayon temple featuring some 200 mysterious faces carved in its many towers. Then enjoy an inspiring Aspara dance performance-a perfect ending to this remarkable and cultural journey!